With all the talk in the digital world today about digital marketing and how it helps online marketers and entrepreneurs quicken their business growth, one can’t overlook different approaches to master their digital marketing strategy. Now is the time to learn how to dominate all online channels together to create a 2016 digital marketing strategy built to deliver optimal brand experience. 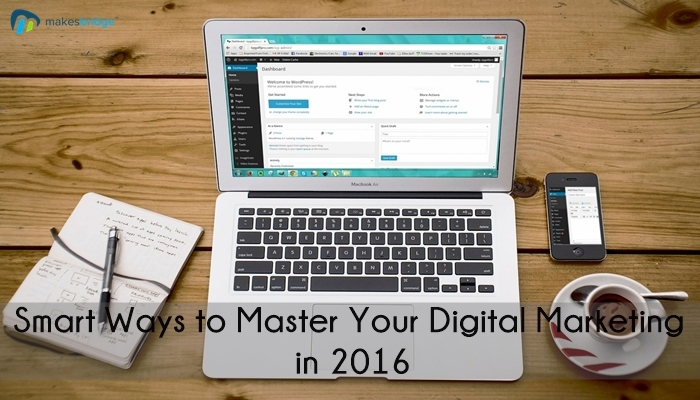 To help digital marketers discover new opportunities for driving a ROI, I have identified 12 ways to improve your digital marketing strategy in 2016. Your brand repute is an image of your target audience’s emotional experience. That suggests you can be the best candidate or give the best product or service and still be considered as dry, boring, and out-of-touch. You must transit your brand voice to be relationship-focused. Telling a story, being amusing, and having sympathy will resonate with your target audience and enhance your brand image. Have you started to bid on keywords related to the service you are offering or the product you are selling? Google now processes more than 40,000 search queries every second averagely, which means more than 3.5 billion searches for each day. People are openly searching for information on the search engine behemoth before making a buying decision. Bidding on the best possible keywords directed towards your region and demographic can drive instant new business if properly executed. The effect of traditional types of advertising like daily papers, radio, and billboards, are difficult to measure and usually leads to fruitless resources. A strong focus on digital ads will give you the chance to leverage information and enhance your ROI. A study by Search Engine Land shows that “…just about 25% of marketing accounts average above a 5% conversion rate.” How can you break through the 10% barrier? The answer is custom landing pages. By using marketing automation tools like Makesbridge that also allows you to design a responsive landing page, you can build, design and launch A/B test landing pages without extraordinary Information Technology. Search Engine Land states that to break into the top 10% of landing-page performance, you have to test 10 distinctive landing pages to discover one that is really effective. With rising income expectations for marketing professionals, you may be asked what a click to the site, a follower, or a lead is worth to the business. Try to do some research into your conversion rate from these strategies, and determine what people are expected to spend after visiting and using your digital channels. This will give you (and your CFO) a better idea about the actual worth that you’re bringing to the table, and why you should be given more of a budget to put resources into specific zones. You can use Makesbridge dashboard to perform your A/B testing in order to test the relative strength of which marketing message is getting more approval. See this tutorial to learn how Makesbridge dashboard can help set up an A/B test. Always let your C-Suite know that you have the ability and awareness of what is going on in your industry by studying your competitor’s activity. Search for fruitful case studies with platforms, tools, and social campaigns that you feel would work for your marketing efforts. Highlight how comparative results are achievable, and how they may benefit you. Act as a professional and try to contribute your content on powerful and well known websites. This is a way to drive referral traffic back to your site from readers who might be interested in knowing about your insights. Make a “dream list” of 10 sites you need to write content for. Make sure that you send each of these 10 publications a convincing pitch that passes on what you will bring to the table by sharing your views on their site. Did you ever wonder how the jeans you looked at on Levi’s website mysteriously showed up on your Facebook newsfeed within 10 minutes? This is what we call the magic of display remarketing, and it is among the best ways for you to catch up with website visitors who don’t make a desired action on your site. Display remarketing creates brand mindfulness and is a way to motivate customers to return to your site to convert. People will think you’re spending a lot of money on your marketing when your ad shows up on CNN.com, but they don’t know that actually you’re just paying around $0.30 per click because of a great remarketing campaign! Gartner’s 2015-2016 CMO report proves that 98% of advertisers consider that digital and offline marketing are merging, so your technique should reflect this. By illustrating how digital elements of your campaigns and analysis can help, or even lead broader campaigns, you can ask for more budget to be assigned to digital channels over other areas. Content is king. It was true in the past and it is even true at the moment. From running an online blog to posting on social media and sending e-newsletters, the more content you create on a steady basis, the better your odds are to reach a potential buyer, contributor, or customer. Although at times putting in the hours to create content can often feel wasted, it is a way to build the base for your future success. Or, you could choose an alternative and outsource this function. Marketing Land maintains that 90% of customers’ buying decisions are influenced by online reviews. Ensuring that your Google+ and Yelp pages represent your company in a positive way will create more business for your company. Make an email template for your business to send customized messages to satisfied customers or clients. You can use Makesbridge tool to use or create a new email template. See how you can create a new template with Makesbridge.